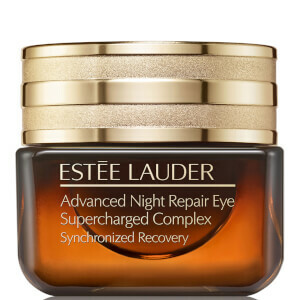 The Estée Lauder Advanced Night Repair Synchronized Recovery Complex II Duo combines two anti-ageing skincare solutions that work in synergy to promote smoother, brighter-looking skin. 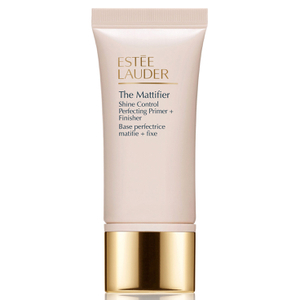 A radiance-enhancing and anti-ageing serum that works with skin through the night to promote a smoother-looking, youthfully glowing visage. Formulated with exclusive ChronoluxCB™ Technology, which maximises the power of skin's nightly renewal, the night-time treatment has been tested and proven on over 500 women* and is known to leave skin feeling fresher, well-rested and hydrated. Tackling signs of ageing, it helps to minimise the look of fine lines a and wrinkles while restoring a more even tone and youthful glow. Effective for every ethnicity. 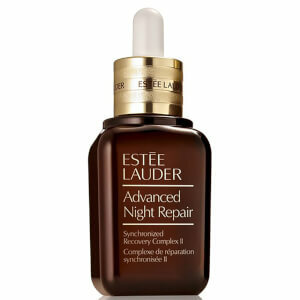 A potent eye treatment that targets signs of ageing and fatigue around the delicate eye area. Specially formulated to tackle the visible impact of lack of sleep, UV rays, pollution and blue light, the lightweight gel-cream texture melts effortlessly into skin, delivering brightening and hydrating properties to leave skin looking radiant and revived. The supercharged eye cream with 10X Concentrated Repair Technology helps to reduce the look of puffiness, lines and dryness while brightening dark circles and providing 24 hour hydration with a potent hydration booster, including Hyaluronic Acid. Visibly reviving and re-energising skin around the eyes, the recharging formula also contains exclusive ChronoluxCB™ to help promote skin’s natural repair process, which is essential for younger, brighter-looking skin. 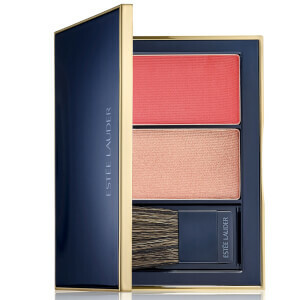 After use, skin around the eyes appears smoother and radiant with a soft, silky feel. Patented until 2033. Proven for all ethnicities. Ophthalmologist and dermatologist tested. *Consumer testing on a total of 520 women for 4 weeks. Serum: Water\Aqua\Eau, Bifida Ferment Lysate, Methyl Gluceth-20, Peg-75, Bis-Peg-18 Methyl Ether Dimethyl Silane, Butylene Glycol, Propanediol, Cola Acuminata (Kola) Seed Extract, Hydrolyzed Algin, Pantethine, Caffeine, Lecithin, Tripeptide-32, Ethylhexylglycerin, Sodium Rna, Bisabolol, Glycereth-26, Squalane, Sodium Hyaluronate, Oleth-3 Phosphate, Caprylyl Glycol, Lactobacillus Ferment, Oleth-3, Oleth-5, Anthemis Nobilis (Chamomile), Yeast Extract\Faex\Extrait De Levure, Choleth-24, Hydrogenated Lecithin, Ceteth-24, Tocopheryl Acetate, Ethylhexyl Methoxycinnamate, Hexylene Glycol, Carbomer, Triethanolamine, Trisodium EDTA, BHT, Xanthan Gum, Phenoxyethanol, Red 4 (Ci 14700), Yellow 5 (Ci 19140) <ILN39632>. Eye Treatment: Methyl Trimethicone, Water\Aqua\Eau, Bifida Ferment Lysate, Dimethicone, Dimethicone/Vinyl Dimethicone Crosspolymer, Propanediol, Petrolatum, Sucrose, Algae Extract, Hypnea Musciformis (Algae) Extract, Acrylamide/Sodium Acryloyldimethyltaurate Copolymer, Butylene Glycol, Yeast Extract\Faex\Extrait De Levure, Tripeptide-32, Sodium Hyaluronate, Lactobacillus Ferment, Sodium RNA, Citrullus Vulgaris (Watermelon) Fruit Extract, Poria Cocos Sclerotium Extract, Lens Esculenta (Lentil) Fruit Extract, Pyrus Malus (Apple) Fruit Extract, Anthemis Nobilis (Chamomile) Flower Extract, Narcissus Tazetta Bulb Extract, Caffeine, Sodium PCA, Tocopheryl Acetate, Phytosphingosine, Trehalose, Glycine Soja (Soybean) Seed Extract, Isopropyl Jojobate, Betula Alba (Birch) Extract, Peg/Ppg-18/18 Dimethicone, Ethylhexylglycerin, Gelidiella Acerosa Extract, Tromethamine, Polysorbate 80, Artemia Extract, Hydrolyzed Algin, Isohexadecane, Jojoba Alcohol, Jojoba Esters, Glycerin, Acrylates/C10-30 Alkyl Acrylate Crosspolymer, Hydrogenated Lecithin, Polysorbate 40, Caprylyl Glycol, Sodium Lactate, Lecithin, HTT, Potassium Sorbate, Phenoxyethanol, Iron Oxides (Ci 77491), Iron Oxides (Ci 77492) <ILN45118>.